From its beginnings in the late 70’s in a small tin shed, Billman’s Foundry has steadily grown and enjoying a reputation for craftsmanship, has seen its work exported to Europe and Asia. We are proudly 100% Australian Made and Owned. Billman’s Foundry has contributed to streetscape upgrades in Castlemaine, Bendigo, Ballarat, Maryborough, Daylesford, Tamworth and Mildura. Our cast iron light columns, seating, fencing, bollards and bronze fountains can be seen throughout streets and parks in these cities. Heritage restorations from Rushworth to Botany Bay also boast many fine examples of our work. – Federation Field of Bells project, casting more than 2000 handheld bells of 2 kilograms to bells of over 1000 kilograms in weight. – Reproduction of Aluminium Gates for the Singapore Palace in Singapore. – Peter Brock Memorial (car only) in Bathurst for artist Julie Squires. – Light Columns with Graham Edwards – Movie World Theme Park Germany. – Restoration of the Fountain in Victory Memorial Gardens, Wagga Wagga. – Restoration of the Wills Street fountain in Daylesford. The remains of this fountain arrived looking like a pile of rubble. 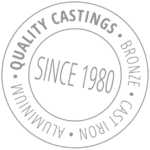 Always willing to accept a challenge, Billman’s highly skilled workforce produces quality castings in bronze, cast iron and aluminium.